SIMPSON BAY, St. Maarten (March 2, 2014) - Seaborne Airlines, one of the fastest-growing airlines in the region, was airborne from San Juan, Puerto Rico to the Princess Juliana International Airport (SXM) as it executed its maiden flight to St. Maarten on Saturday, March 1, 2014. 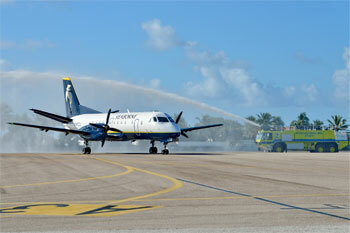 Met with the traditional water cannon salute, the Seaborne Airlines Saab 340B 34-seater aircraft touched down at SXM Airport at 7:40 PM, an hour after it took off from San Juan airport (SJU). It is scheduled to depart SXM daily at 8 AM, arriving at SJU at 9:10 AM. “St. Maarten is yet another exciting destination in the Caribbean that Seaborne is offering to our customers, as we build important trade and tourism links throughout the Caribbean,” said Gary D. Foss, president and chief executive officer at Seaborne Airlines. “We are indeed happy to welcome Seaborne Airlines to SXM and see its expansion into this destination as an opportunity to further consolidate airlift into San Juan, Puerto Rico, and thus increase connectivity to the larger US market, our main source of tourists,” said Regina LaBega, managing director of SXM Airport. LaBega noted that the airline’s daily schedule allows for passengers to travel to San Juan on business trips, leaving St. Maarten in the morning and returning in the evening. In fact, given its code-sharing and interline agreements with American, JetBlue and Delta, Seaborne Airlines will have connecting agreements covering more than two-thirds of the seats operating in and out of San Juan from the US mainland. With 12,048 daily seats from 22 US locations, San Juan has by far the largest number of seats from the US mainland to the Caribbean. LaBega further pointed out that as a growing hub in the Northeastern Caribbean, Seaborne’s service to SXM from San Juan will benefit its country partners. Within its first year of operations, Seaborne Airlines projects that it would have carried about 10,000 passengers to St. Maarten, and have an estimated US$14 million impact on the St. Maarten economy. Seaborne, which recently relocated its headquarters to San Juan, Puerto Rico, has 20 years experience as an operator with focus exclusively on the Caribbean. Recently, it also announced service to Las Américas International Airport (SDQ) in Santo Domingo, Dominican Republic – with non-stop service from Luis Muñoz Marín International Airport (SJU) in San Juan, Puerto Rico, effective April 15, 2014. Santo Domingo will be Seaborne’s fourth destination within the Dominican Republic, the others being La Romana, Punta Cana and Santiago, where it will fly as from March 15, 2014.